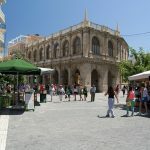 Heraklion is the Capital city of Crete and is situated on the east side of the island. 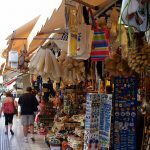 Its the main economic centre of Crete and has a wealth of hotels, Taverna's, shops and businesses for you to explore. 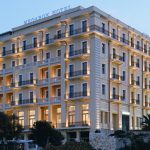 Heraklion attracts visitors from all over the world to stay in the 5 star hotels, wander the twisting alleys, relax in port side cafes, and most of all to visit the Museum and Palace of Knossos which lie in the city and prefecture of Heraklion. 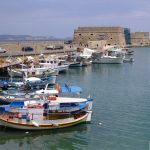 Heraklion has a population of around 150,000 people, quite small compared to Cities at home but Heraklion sprawls over the landscape and is home to the famous Knossos Palace, Knossos Museum and the Naval Museum. Its also the birthplace of Nikos Kazantzakis a famous Cretan author who wrote such books as Zorba the Greek. So popular is Nikos Kazantzakis that the airport in International Heraklion is named after him. 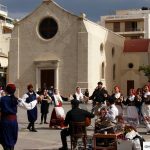 The cultural heritage of the city of Heraklion offers a variety of forms of modern entertainment. Every year the city as well as numerous villages in the surrounding area, organize cultural events such as theatrical performances, art exhibitions, musical nights and festivals which attract locals and visitors alike. 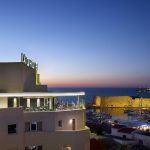 For those after a more up to date nightlife scene Heraklion is amazing for bars and clubbing. 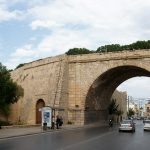 Heraklion is a city with one foot rooted in the past, the other foot stepping into the future. 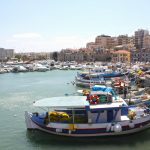 It is a very dynamic and cosmopolitan town, particularly during the summer period when thousands of visitors can be seen shopping in the market or visiting the Museums of Heraklion and other places of interest. If you’re looking for beaches then there are a few near the centre itself but most of the beaches sit just outside of the town. They range from beautiful sandy beaches to pebble and shingle beaches. Most have a wealth of cafes and sunbeds for you to use. 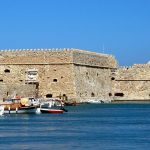 If you begin a walk around Heraklion, starting at the fishing harbour close to the modern port, what will strike you first is the Venetian fortress at the harbour gate. The fortress was originally built by the Venetians and called Rocca al Mare, but is now known by its Turkish name, Koules. It has a mixed history; for centuries it was used as protection against invaders, as were the great city walls and ditches. These are among the longest city walls in Europe. With its huge dark hallways and cells, the fortress was also a prison to many Cretan rebels and those who broke the rules imposed by successive occupiers of Crete. 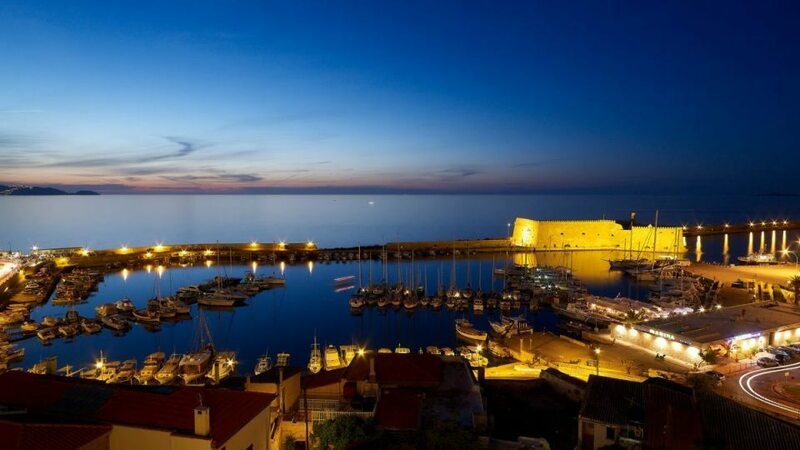 Koules is built on two tiers and offers a commanding view of Heraklion from the battlements. Nowadays, the harbour itself is home to brightly coloured fishing boats and busy Taverna’s selling fresh fish. 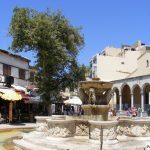 Walk slowly through the Agora, the Market Street that runs alongside a shopping boulevard called 1866, after a Cretan uprising. The market is large and sprawling, from top to bottom, with some shaded sideways exits, this old Market Street is still a place for ‘Herakliotes‘ to come every day to find socks, shirts, herbs, fish and fresh meat. It’s a good place to find thyme honey, Raki (the Cretan clear spirit) from among shops selling everything from selections of Cretan music to the finest cheese. There is also a weekly market located now towards the outskirts of the city and hosts more locally made products at lower prices. Usually you will find dates and times differ and local travel agents in your resort are your best point of contact. Heraklion has a wealth of restaurants offering everything from traditional Greek food to more continental dishes. 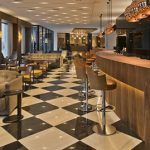 Three of the most popular restaurants have to be Kyriakos – This restaurant is situated on 53 Leoforos Demokratias and is known as one of the most stylish restaurants in Heraklion. 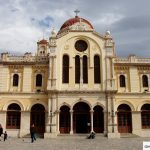 The second is Loukoulos which is situated on 5 Korai street Loukoulos is located in the heart of the city and features a traditional Greek setting. 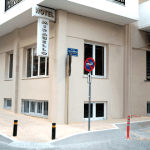 The third Taverna is Ippocampus which is situated on 3 Mitsotaki street and is a very popular dining spot with locals. Their specialties include tasty appetizers such as zucchini slices which are dipped in a delicious batter and deep-fried, as well as deliciously prepared fried squid.so try nearer the main fountain in the city centre you will find a variety of smaller cafes. There are fast food cafes, including McDonalds and KFC, as well as local Greek fast food places serving up delicious Souvlaki and Gyros. 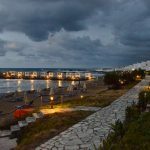 For nightlife we recommend Aposperides – This is a brilliant place for those who wish to indulge in an evening of traditional Cretan music and hours of dancing. This is a very popular entertainment spot with tourists. Also give Veneto Bar – Situated on Epimenidou a try for more modern music and nightlife. Nightlife in Heraklion is very advanced and the bars are modern and contemporary, expect to pay a higher amount for drinks than you would in the holiday resorts, a lot of people compare the price of drinks in nightclubs to that of clubs in London.